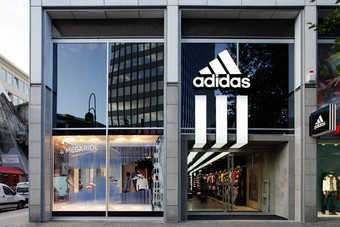 Sportswear giant Adidas continues to be on track to reach the growth targets set out in its Route 2015 strategic plan, despite a challenging year in which criminal activitity in its Reebok India business, and sales declines at the Reebok brand, weighed on its business. The Reebok brand as a whole has had a tough year, after it lost its licence to produce NFL (National Football League) clothing in April and an NHL (National Hockey League) player contract dispute shortened the ice hockey season, of which it is the official jersey manufacturer. As a result, the brand's revenue declined 18% over the year to EUR1.6bn, and it recorded an "essentially flat" gross margin at 37%. CEO Herbert Hainer told analysts on Thursday (7 March) it was "not a bad performance" given the high levels of promotion used to move its toning products during the year. He said Reebok has begun to see sales stabilise, with a rise of 3% achieved in the first quarter, excluding licensed products - and a jump of almost 40% in apparel. Hainer is forecasting the brand will return to growth in the second quarter of this year. Looking ahead, the company is planning to reposition Reebok as a fitness brand, with options for a range of fitness activities included as part of its "brand offensive". To accelerate this growth, there are plans to launch several new innovations and partnerships across the year. In Running, it will launch three new platforms, while in fitness training it will launch the Reebok Delta Apparel collection. There will also be new partnerships to add "credibility" to the categories. Adidas Group also revealed more details of the activities that led to it firing its senior management team at Reebok India in May last year. An internal investigation uncovered inappropriate recognition of sales, a failure to book sales returns, and a failure to correctly post credit notes to accounts receivable. This resulted in a "significant overstatement of net sales and accounts receivable, as well as incorrect accounting for materials and provisions," explained CFO Robin Stalker. The investigation process also discovered four secret warehouses not included in official accounting records. Stalker said the company will record a reduction in net income attributable to shareholders of EUR58m for 2011, and shareholder equity in the opening balance sheet for 2011 was negatively impacted by EUR153m to account for the prior year. He said it appears that the process of overstating sales and profits had been going on for "several years". Meanwhile, Adidas said that while labour and raw materials hit "record highs" in 2012, it had been able to protect its margins, which edged up over the year. Indeed, a 3.8 gross margin percentage point rise in labour and raw margin costs over the year was offset by price increases, growth in emerging markets, and an increasing share of retail sales. The comments came as Adidas recorded full year gross margin of 47.7% in 2012, up on the 47.5% it recorded in 2011. Looking ahead, Hainer added that the brand is also looking at ways to re-engineer products in a more cost efficient way. Over the year, net income fell 14% to EUR526m. Excluding impairment charges relating to the Reebok brand, net income grew EUR791m, a 29% increase. Revenue grew 6% on a currency neutral basis, rising 12% in euros to EUR14.8bn.